Memorize, color, score points! 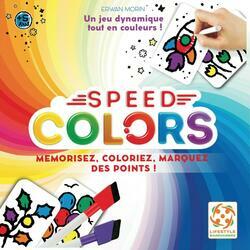 The concept of colouring books transformed into a fast and original memory game! Each player takes a card and memorizes the color distribution on the image. Then, everyone turns their card over black and white and tries to color the right colors in the right places. But be careful: you will have to be fast and accurate to earn points! Contents of the box : 6 markers with a cleaning sponge, 5 stitch cards, 55 image cards, 1 rule booklet.